No Arkansas parent wants their child to attend a failing school. Proponents of school choice argue that open enrollment charter schools—an alternative to traditional public schools—improve the performance of the students they enroll. Opponents argue that open enrollment charter schools erode the quality of education and hurt the performance of the students that they enroll. We can evaluate these arguments by comparing the performance of traditional public schools with that of open enrollment charter schools in Arkansas using the results of two sets of standardized tests: the 2014–15 Partnership for Assessment of Readiness for College and Careers (PARCC) exams and the 2015–16 American College Testing (ACT) Aspire exams. Figure 1 shows the percentage of students that met or exceeded expectations on the 2014–15 PARCC exams for both traditional public schools and open enrollment charter schools. Source: Constructed using data from the Arkansas Department of Education. On the 2014–15 exams, traditional public schools performed better in math by 1 percentage point, while in literacy, charter schools performed better by 3 percentage points. Arkansas changed the exam type from PARCC to ACT Aspire for the 2015–16 school year. 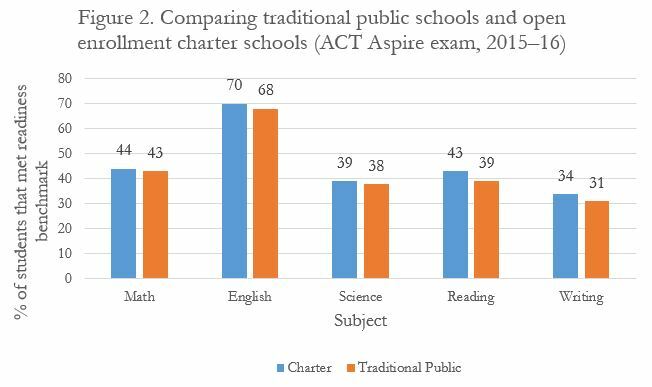 Figure 2 compares the ACT Aspire results for traditional public school students with the results for open enrollment charter school students. It shows the percentage of students in each school type that met readiness benchmarks in math, English, science, reading, and writing. In all subjects, open enrollment charter schools on average performed better than public schools on the 2015–16 exams. Further empirical analysis by education and public policy professor Gary Ritter and others (2016) at the University of Arkansas has found that students attending open enrollment charter schools do indeed perform better than students in traditional public schools. The analysis accounts for the possible differences between the students in open enrollment charter schools and traditional public schools, such as student motivation levels and family socioeconomic background. Instead of comparing open enrollment charter school students to the whole traditional public school population, Ritter and his team compared them to students who are similar, with the only difference being that they attend traditional public schools instead of open enrollment charter schools. The researchers found that test scores for students in open enrollment charter schools were significantly better in both math and literacy than the scores for comparable traditional public school students. Individual open enrollment charter schools that do not perform better than traditional public schools run the risk of being closed as required by law, so they have an incentive to outperform. 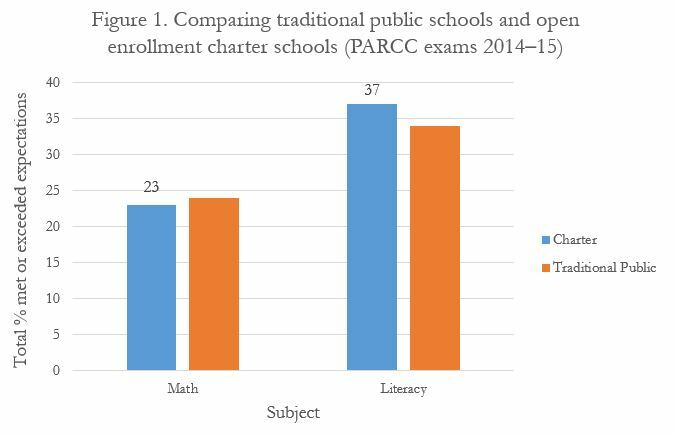 And the evidence does indeed show that open enrollment charter schools are performing better than traditional public schools.